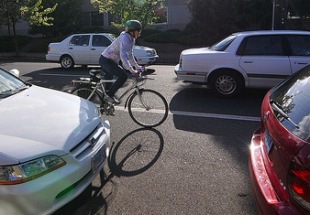 The stories below were written by BikePortland readers. We’d love to share your stories on the Front Page. 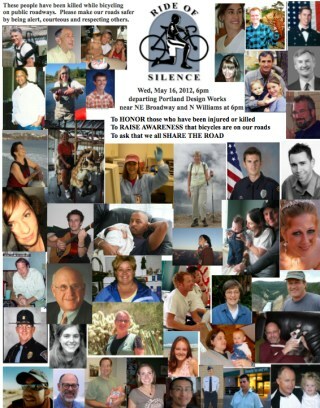 If you’d like to send one in, please use our submission form. 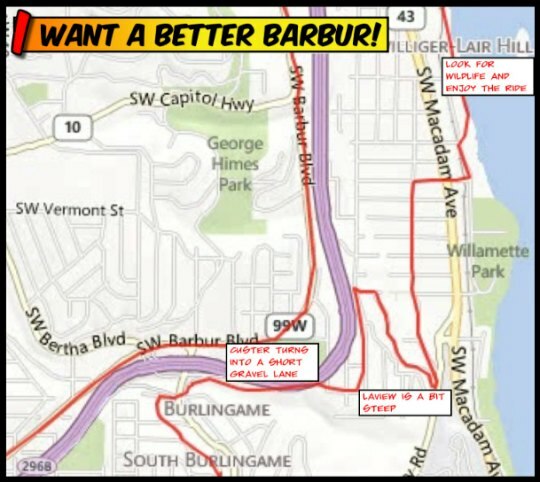 Reader Kevin Wagoner created this map to help explain his favorite new way to avoid SW Barbur Blvd on his daily commute. 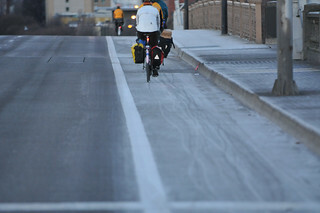 As temps increase, so do crowds in the bike lanes. The magic of Forest Park’s northern reach. After I shared a story about a recent ride in Forest Park, I heard from many readers with fun routes of their own. The story and photos come to us from southwest Portland resident Hudson Henry. 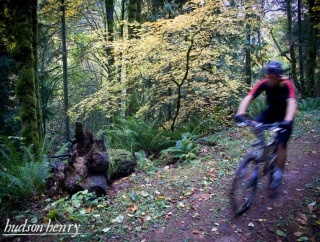 Do you desperately need a mountain bike ride, but don’t have the time to get to the coast range or Gorge? Do you close your eyes and picture that knobby tire leading you carefree through the woods? When I feel the stress build up and really need a quick dirt ride, I head out Highway 30 to the northern reaches of Forrest Park. While the legal riding there is technically on firelanes, the northern lanes are often very rugged and trail like. 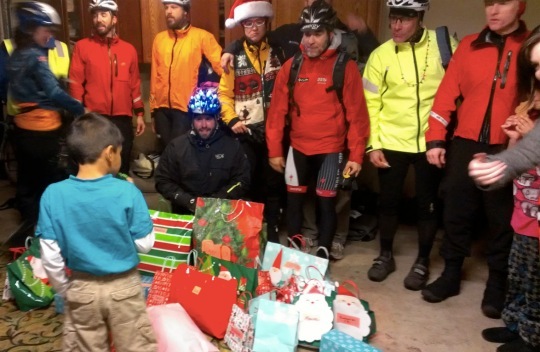 Hammer Velo team members at the recent Pay it Forward ride. are ready to take on the world. The story below was submitted by northeast Portland resident Abra McNair. This August, two Portlanders will head across the globe to Veszprem, Hungary to represent the USA in the World Championships of Mountain Bike Orienteering (MTBO). This will be the sport’s tenth annual World Championship competition, but only the first time the US Orienteering organization has fielded a team. 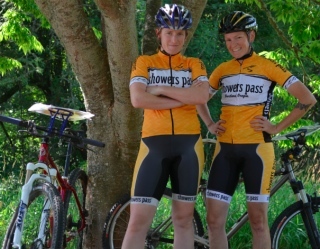 Susan Grandjean and Abra McNair, two members of Portland’s bike racing scene, will be joining forces with Seattle’s Rebecca Jensen to create the first ever female MTBO team from the United States. Each athlete will participate in all races offered, including sprint, medium, and long distance courses; plus a team relay. 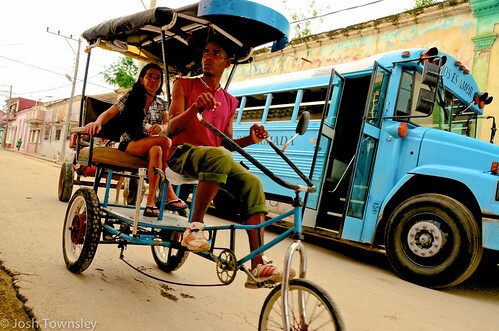 People and their bikes from Cuba. Photos by Josh Townsley. Bike polo players in Alberta Park. 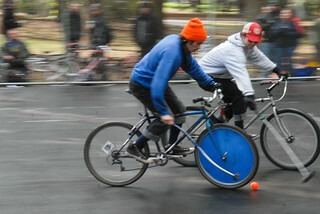 Portland Bike Polo has progressed over the past ten years from an offshoot of an indie messenger sport to a large group of athletes practicing year-round for national and international tournaments and putting on community outreach programs. 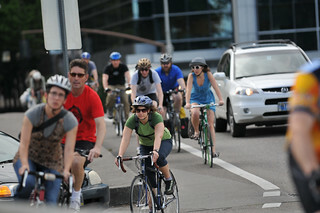 Every week in Portland, rain or shine, twenty to fifty people come out to play a fun and challenging team sport on the pavement that combines individual bike riding ability with the ability to work and compete as a team. With Jonathan’s recent mention that Effective Cycling (the vehicular cycling bible) will be republished, it seems like a good time to share some thoughts on cycling facilities that I developed after attending Towards Carfree Cities IX in York, UK. At the conference, I noticed a theme emerging in discussing street configuration: mode separation vs. shared space. Separating modes (like walking, cycling, and driving) means putting them in different places on a street, or allowing them to proceed at different times through an intersection. In the US, we think of separation as normal for people walking. They go more slowly than vehicles, so we give them their own place on the street: the sidewalk. But it wasn’t always so.